I had a thought today thinking about the Dragonborn book (see my review, btw), in that that book serves as a perfect companion to a DDI subscription. If you have a DDI account, and you don’t get any of the books because you assume that all you need is in the compendium, character builder or adventure tools, then you are left to your own devices to figure out the fluff behind the material. DDI, after all, is all stats (minus of course the magazines, I’m thinking more builder/compendium). So then now (in my opinion) WOTC faces a conundrum: how to get people who will stop buying books because DDI has all they need to buy books again? Well, first your hardcover books have to have a lot more creativity behind them than just stats and numbers. There needs to be fluff, and I think that they get it over there at Wizards. As @krypt0nian pointed out on twitter, since Primal Power came out, the fluff content in the books has grown. This is particularly present in the Dragonborn book, where I think there is a greater emphasis on the fluff rather than the crunch of the book. Of course, all this fluff matters only if you care for and like their 4e setting, although you can always mine content off of it for your campaigns, as I do. I’m not enamoured of their fluff, so am quitting at the three core rules books. I don’t need their extra monsters, players guide, dms guide or subscription service. If we can’t manage to figure out how to make a character or level up without a program, then we’ll play something else. I thought Open Grave, Dragonomicon, and Manual of the Planes contained a lot of good fluff. WotC folk have actually been very open (on the D&D Podcast, for example) that increased story content (fluff) was a priority for Primal Power, in part because the whole primal power source is something new to D&D with 4e (druids used to be divine spellcasters in earlier iterations). However, I have not read through Primal Power yet, so I can’t comment on their level of success in that book. Although it goes against one of the fashionable criticisms of 4e, I perceive that WotC has been very keen to pump up the fluff since the very beginning of 4e. It might not have showed as much in the first wave of core books, since they were trying to cram so much in there. But even with something as seemingly fluffless as magic items, WotC has tried to inject fluff in the form of artifacts, item sets, hoard items, and so on. Since I am almost always playing from the DM’s side of the screen, my attention has been more on books like Open Grave, the two Draconomicons, Manual of the Planes, The Plane Below, and Underdark. Personally, I am very happy with the fluff/crunch balance in those books. They’re like Reese’s Peanut Butter Cups made with crunchy peanut butter. Mmm, mmm, good. Oh, wait. That’s Campbell’s Soup. Anyway, I think the same applies to Dragonborn. One of 4e’s strengths, in my opinion, is the marriage of fluff to crunch. To put it a different way: in 4e, fluff often has crunchy consequences. Backgrounds are the perfect example of this, though I think that paragon paths and epic destinies pull this off very well also. @Rob Leduc: You can easily play 4e with just the first wave of PH/DMG/MM, obviously, and like Fleetwood Mac says, you can go your own way on the basis of the core mechanics. The point of the Character Builder is just to make it easier to coordinate character elements from many different sources. Limiting yourself to just the three core books works just fine, of course, but it also cuts you off from barbarians, bards, druids, sorcerers, and more. I have purchased every D&D 4e book except for the Eberron Campaign Guide, and I don’t find any of them to be useless as I prepare my adventures. Often it is not a matter of “needing” them as it is of finding ways that they save me a bunch of prep time. While I think WotC does a nice job with their fluff, I think they’d ultimately lose if they tried to be a primarily fluff-provider, and limited their crunch to the software. I just don’t think they can compete with the gaming community at large. I’d argue that, like the “million monkeys with a million typewriters will eventually duplicate Shakespeare” idea, that the gaming community can out-fluff WotC purely based on the number of creators out there. I think Chris Perkins’ Iomandra campaign is a perfect example of this. Yeah, he’s a WotC employee, but his work on the campaign isn’t being sold by WotC, and (frankly) I think it’s some of the most creative stuff I’ve seen from them. Troll through Obsidian Portal and you’ll find a lot of interesting fluff. I have found it difficult to even keep track of third level characters withou the software, even though we just use the PH1. I couldn’t imagine adding any further complexity at this point. If they want to sell me more books, I think they’re going to have to make the character builder a free download (for all levels). If it gets too cumbersome, I’m off to Pathfinder or some other game. Rob, I’ve heard that complaint several times, and I tend to agree with it. With the amount of options available for players, I think they are making the software too essential to play the game, and that’s a mistake. One thing you could do, however, is split the price of subscription amongst all members of your gaming group. 10 or 12 bucks a year isn’t that hard to pay I think. But your complaint has merit. The Character Builder is no more essential to play 4e than third-party OGL solutions like HeroLab or PCGen were to play 3.5e (or Pathfinder). Aside from its glorified calculator functions, the CB just pulls all character options into a one-stop shopping storefront. And since the 4e rulebooks are more strictly divided into “player books” and “DM books” than 3.5e books ever were, I think it’s actually easier to play 4e with just books than it was to play 3.5e with just books. Let me illustrate. Imagine that I’m playing a human paladin and not using software of any kind for character generation/maintenance. Also assume that the DM has the policy, “If WotC published it, it’s available in the campaign, unless it’s setting-specific like Forgotten Realms or Eberron.” Let’s also say that my paladin is about to advance to 6th level. 3.5e — When I level up, I look first in the PH for basics. At 6th level, I gain a feat and a spell. I consult the PH for feats … and then Complete Adventurer, Complete Champion, Complete Divine, and Complete Warrior, all of which might have paladin goodies tucked away inside. I consult PH2 to see whether it has any feats for me or any options for swapping out paladin class features. If we’re playing in a particular environment, I might need/want to look through Cityscape, Frostburn, Heroes of Battle, Heroes of Horror, Libris Mortis, Sandstorm, or Stormwrack. And, of course, I wouldn’t want to forget the possible options in Unearthed Arcana. Oh, I’m human. I almost forgot to check Races of Destiny. Now I need to repeat the process for my new spell at 6th level. Same sourcebooks. And I need to carry each sourcebook I use to the game with me, or copy the information out of onto a character sheet or a 3×5 card or something. 4e: When my paladin levels up to 6th, I will choose a utility power and a feat. The utility powers for paladins are all in Player’s Handbook or Divine Power. Period. I don’t have to worry about any other books. For feats, there might be something I’d want in Player’s Handbook 2. Now I’m up to three books, tops, until Divine Power 2 or Player’s Handbook Races: Humans comes out. Add Adventurer’s Vault 1 and Adventurer’s Vault 2 if I’m shopping for magic items, but I don’t need to think about AV n for feats or powers. Don’t get me wrong: I think the Character Builder is a wonderful tool. I love its convenience, and it is definitely a big time-saver. But I hardly think it’s indispensable. And I certainly don’t see how a 4e character can be harder to manage without software than a comparable 3.5e character. Pathfinder might be easier to manage since it just has the one core rulebook right now, but if part of Pathfinder’s appeal is “I still get to use all my old 3.5e stuff with it,” then you’re no better off than in 3.5e (worse, in fact, since you have to convert some 3.5e elements to make them PFRPG compatible). My last experience was 1e, so I’m used to three books max, and only needing one of these for character building/design. Even the relative simplicity of 4e relative to 3e seems too much. Frankly, it all smells too much to me of marketing-driven design. The game seems designed to want to make you subscribe to get the tools, ensuring a steady income stream from subscriptions long after the initial book sales are over. I much prefer them getting a nice steady income from the tools (though the exclusive magazine articles are also nice), than depending entirely on whether their next book or miniatures set sells well. If this is the reason why they can print a lot of interesting books that I want to buy for their good fluff, rather than a lot of books I “have” to buy so I have access to the feats, classes, spells, monsters, and items that I want then I’m all for it. I hope it doesn’t come across as strange for me to want the company that publishes my favorite game to succeed financially. There Is financial success and then there is designing a game with mechanics that virtually require a subscription to play. These are not necessarily the same thing and may, in fact, be mutually exclusive in the long run. As it is, the game is an uncomprehendable wreck, although it can be played by dropping a good chunk of the “product” as others have noted. But then, there is no reason to add to one’s holdings. I’m sorry you feel that you can’t comprehend the game, but it’s clearly not incomprehensible, since I game with several DMs who don’t use the tools at all. This will be my last off-topic word about this, as I have no desire to clutter newbieDM’s page with a pointless edition war. I’m happy to talk about “fluff” in D&D books, though. Good for you. Next up for you should be health care reform, middle east peace, and reducing the national debt, which should prove trifles by comparison. You’re trying too hard Rob. That last troll was just an aesthetic mess. You need to practice more, perhaps on some easier venues like Gaia Online, before you tackle something like this. I admire your bravado, but right now you’ve got less ham on your hands and more like the whole pork. I’m content to agree with our host that the game is too dependent on the character builder. I’ll add “because it’s too complicated for it’s own good”, which our host may not agree with. As for this particular fluff, what’s it retail for? Can it possibly be worth it, and why not make it up yourself instead? Personally, I can’t see buying such a document for several of the nonhuman races for cost reasons. Is there something particularly special about this race that justifies the expense? Are 12 year old kids expected to be buying this stuff? How can they afford to get into the hobbey? Rob, you’re being insanely predictable right now. Feigning indignation and falling back on the “IT’S ALL MY OPINION” doesn’t work when your last attempt was sarcasm trying to connect learning an RPG with bringing about middle eastern peace. The troll’s greatest weapons are subtlety and ambiguity Rob. You’ve outed yourself. You’re like an undercover agent who just shot the mob boss in the crotch. On the first meeting, over rigatoni and garlic bread. Delicious garlic bread, of which you will never partake. And I would submit my opinion that 12-year-olds purchase these books by sacrificing their classmates to a Grave Thing, because I guess we can’t fathom any other way for 12-year-olds to have the income to purchase this book. As they grow older, perhaps they find greater eldritch horrors to which they may offer viscera, commensurate now to purchases of greater value. Are you a Gug, Rob? Perhaps you can answer this for me. If you saw what I did there, then I have hopes for you yet Rob. There is a third option between subscription and using just the core rules. Buy 1 month of DDI. Download the character builder for you and four buddies. Enjoy the crunchy parts of the books and magazines published so far. (and updated with all errata and changes) After a year or so, you buy another month and update all five computers with that year’s products. If you divide the cost of that one month’s subscription five ways, then you can get a year’s worth of crunch for less than a cup of coffee. That’s a good deal. Especially if your group likes to spin it’s own fluff. As for buying the fluff for all of the available worlds/power sources/races/etc. It’s like any system – you get the stuff that interests you. Most players like certain races, dislike a couple and are ambivalent to the rest. Buy the ones you like, borrow the ones you play once in a while and ignore the ones you can’t stand. That’s a great way to get the program if, like me, one isn’t interested in every possible power, and hence don’t need updates (as long as the program keeps working when your subscription runs out). Thanks for that. I still can’t see value in these extra volumes on particular races or classes – and of course there will end up being a whole lot more of them. And they have to come with yet more powers and options, naturally. Thus, the inevitable Eladrin and Ranger books of fluff/crunch can provide even more race and class features for your Eladrin multiclass ranger (two blade) warlord or whatever gobbledygook you can chain together. It parodies itself. Or maybe you just get the Eladrin book because they interest you. But then that race gets extra choices compared with other classes which might make that race too desirable from a gamist standpoint and reduce the frequency of other races for PCs. Or maybe you don’t use the extra rules -just the fluff. But then, you could have just done that part yourself. I do worry that kids my sons’ age won’t get into the hobbey because of the cost barrier. Without them, D&D dies in 15-20 years, unless it collapses under it’s own weight before then. 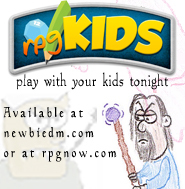 Cost didn’t stop tweens and teens from playing 2nd edition, or TSR from publishing a truckload of supplements, campaign settings, and more. It thrived for a good decade. Ditto 3.5e. Sorry, I hit “Submit” too soon. Rob, your comment about race books “reduc[ing] the frequency of other races for PCs” only adds up if you assume that everybody in the play group is using just one player’s set of books. Only in that situation would Player A’s purchase of Player’s Handbook Races: Whatchamacallem make whatchamacallem “too desirable” due to the spread of options. A player more interested in whoozits can purchase Player’s Handbook Races: Whoozits for him/herself and get a similar spread of options for the chosen race. Because of this structure, 4e is certainly more cost-efficient to the average player than 3.5e, and arguable more so than 2e or even AD&D. Regardless of edition, it all depends on players’ choices about what resources to purchase. Of course a player who purchases more books will have more options for his/her character, but it’s been that way in every edition of the game since AD&D (even the late 70s boxed sets came in “tiers”) and 4e delivers the options more efficiently than previous editions. There’s no self-parody here (not from WotC, anyway), just an ever-expanding range of choices for players/groups who want those choices. Players who choose not to access those options (by not buying the relevant books, or not buying a DDI subscription) can still have plenty of fun with the three core rulebooks, of course. This is the same issue that some people had with World of Darkness with their infinite splatbooks. But I think WotC is doing one thing better. All rules go through the R&D team for balance. So far it looks like they are doing a good job in not introducing any unbeatable combos. Supplements are always going to be with us. Gaming is a low-profit industry and companies need to have a steady stream of releases in order to make a profit. WotC has the advantage of being the 900-lb gorilla, but they have to appease their corporate masters with profits. If they make books people want to buy, then they’ll prosper. If not, then they’ll try something else. Another issue I’ve seen is that people used to talk about “cookie cutter characters” with 4e. I could see that argument when it was just the options in PHB1. As the game has gotten bigger, there are now a lot more options to customize your character. Since I haven’t seen power creep, it’s making the game broader and richer.